New Delhi : In a major breakthrough, the National Investigation Agency (NIA) has identified the Maruti Eeco car used in the Pulwama terror attack of February 14 where 40 CRPF personnel were killed. NIA confirms that the vehicle’s owner, Sajjad Bhat of Bijbehara in district Anantnag of Jammu and Kashmir has direct involvement in the attack. The NIA team said Bhat was missing for the last few days. He was the eighth in the long line of owners who gave important clues regarding the worst terror strike in the Valley in three decades of insurgency. “He [Bhat] has reportedly joined [Pakistan-based terrorist outfit] JeM [Jaish-e-Mohammed, led by Masood Azhar],” NIA spokesman Alok Mittal said. “He was a student of Siraj-ul-Uloom [a madarsa], Shopian. A raid was conducted by an NIA team at his house with the help of J&K Police on February 23. However, Bhat was found not present in his house and thereafter has been evading arrest. He has reportedly now joined JeM. A photograph to this effect has also appeared in social media where he is seen holding weapons,” Mittal added. Reporters, today, confirmed that the investigators had identified the vehicle, that the explosives (25kg of RDX) were carried in a container, and that investigators believed the operation was carried out by a JeM unit in which the explosives knowhow came from across the border but which included some locals including the bomber, his handler and possibly, the owner of the vehicle. 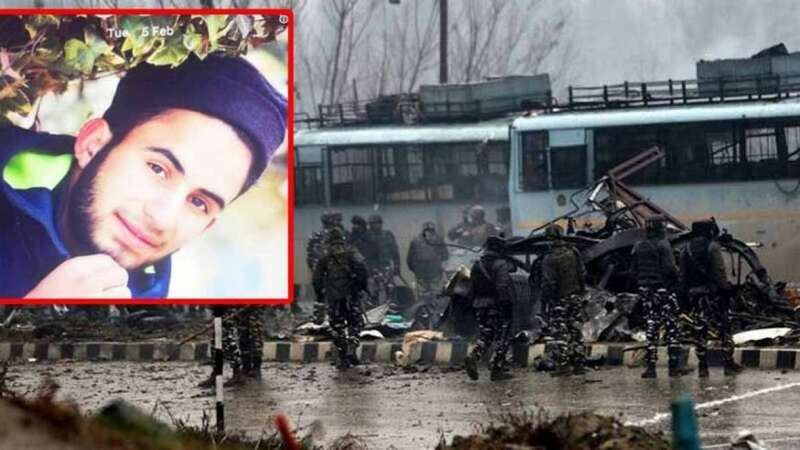 Mittal said that investigators pieced together remnants of the car used by the suicide bomber, JeM operative Aadil Ahmad Dar of Kakapora in south Kashmir, from the scene of crime in the Lethpora area. Dar is believed to have been driving the vehicle alone, he added. “A Maruti Eeco vehicle having chassis number MA3ERLF1SOO183735 [and] engine G12BN164140 was sold to Md Jaleel Ahmed Haqani, a resident of Heaven colony, Anantnag in the year 2011. It subsequently changed hands seven times and finally reached Sajjad Bhat,” said Mittal. Investigators said pieces of vehicle were spread over a radius of around 150 metres and painstakingly collected by the forensic experts working with a team from vehicle manufacturer Maruti Suzuki. “Most of the vehicle parts are generally not numbered, but they can be identified by number of lots in which they were manufactured. Once the lots were identified, the manufacturer checked its computerised data to find out about the lots of vehicles and where they went for sale,” said an investigator. “Initially, we suspected one vehicle that may have been used in the attack but when our team checked the owner, he was found to be using that Maruti Eeco. So, the exercise continued till we identified the vehicle used in the attack,” added the investigator quoted above. Investigators confirmed that 25kg RDX was used in the attack, along with initial findings that the bus which came under target was the fifth in the 78-vehicle convoy. The suicide bomber was waiting for the convoy in a by-lane, and as soon as it crossed, he entered the highway from the left side and detonated the explosives when the bus was on his right. All 39 CRPF personnel travelling in the bus number five died in the attack.